Stealth ABS (Active Breather System) purges and dehydrates the headspace in lubrication and hydraulic fluid reservoirs. The system eliminates the need to continually replace conventional desiccant breathers in high contamination environments. 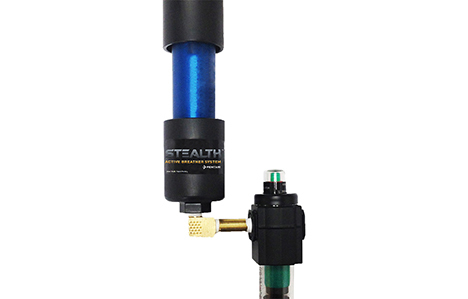 The patented Stealth ABS technology ensures constant presence of clean and dry air in the reservoir headspace, and improves oil quality by removing dissolved moisture. Example drawings of Stealth ABS. Close up of Stealth ABS. Example of Stealth ABS in use. Research has shown that over half of all lubricant contamination comes from outside the system. Most machines that depend on lubrication or hydraulics are designed to ‘breathe’, making them vulnerable to moisture and particulate contamination. The conventional desiccant breathers use filter media to remove the particles, and silica gel beads to remove moisture from the air. 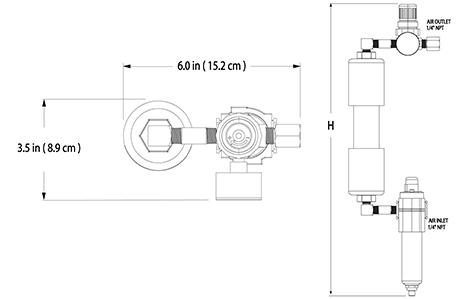 In many environments, it can become very costly to keep replacing these breathers. Stealth ABS controls the moisture and particulate levels in the reservoir headspace, the empty (air-filled) space between the fluid and the reservoir seal that is traditionally a breather cap. 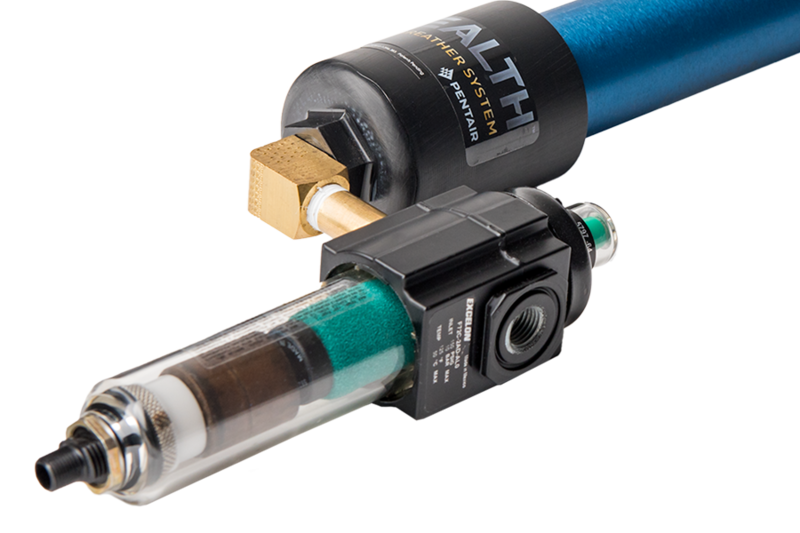 Stealth ABS eliminates the need for continuous desiccant breather replacements. It provides clean and dry air to dehydrate the headspace and remove dissolved moisture from the fluid, thus improving and conditioning the oil. Contaminants in reservoirs can cause corrosion, oil degradation, and wear on bearings. The headspace itself is often a major source. Reservoir fluids with a high affinity for water, such as the phosphate ester-based fluids used in steam turbine systems, readily absorb moisture from the environment. Stealth ABS combats ambient moisture ingression by introducing a steady flow of clean and dry air to help sustain optimum conditions within the reservoir. Fine particles in the ambient air form mineral deposits and rust that can act as abrasives. Stealth ABS helps to stop these effects by filtering submicron particles out of the inlet air stream and by preventing particulate ingress with a continuous air flow. The system works with standard plant air, regulates the volume and pressure, and uses an advanced membrane air dryer to reduce the dew point. The automatic drain means no intervention at all is necessary. In any lubrication and hydraulic system, contamination – in the form of particulates, moisture and gases – can have significant adverse effects on the operation and service life of the oil and process equipment. Contamination is the primary cause of wear, corrosion, fluid breakdown, and loss in lubricity. In many cases, neglect leads to failure or seizure of the entire system. 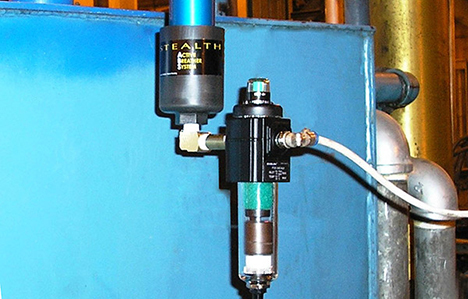 Contamination control has the highest priority for lubrication and hydraulic engineers. Stealth ABS makes contamination control more efficient than ever. Pentair has applied its advanced filtration and separation technologies to cost-effectively remove contaminants and minimize wear, thus ensuring reliable service life, predictable operation, and maximum uptime. Through continuous headspace dehydration, Stealth ABS actively purges and enhances reservoir breathing systems, keeping them virtually maintenance-free.